and Yoshi is an older adoption. Poodle is puddle in German as they are duck hunting dogs. 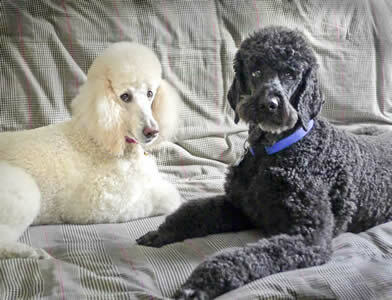 Caniche is Poodle in French, a contraction of cainard (duck) and chien (dog)! Yoshi is Good Boy in Japanese. One of our beloved canine companions died of over vaccination. Over-vaccinating your pet, is potentially life-threatening . Ask your vet about a "titer" instead of a vaccination. Caniche is a cancer survivor. There are many theories, but no answers yet. whose families cannot afford treatment. Yoshi is an older adoption. Shelters are overloaded, so usually the older pets are considered the least adoptable. and adoption organizations throughout the country. © 2009 Lampworks Inc., NYC All rights reserved.